This energy-saving air purifier provides a crisp, clear indoor environment, using up to 95% less energy than other air cleaners in its class. 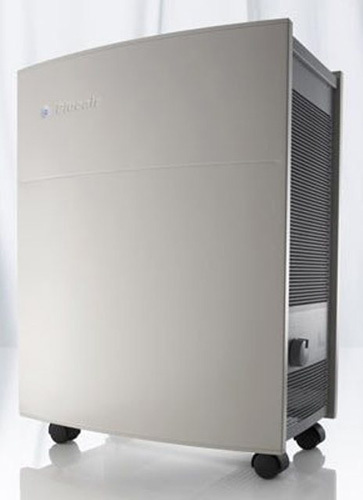 The Blueair ECO10 not only saves energy, but also costs far less to run than other purifiers. All in all, it’s a smart investment in a more sustainable future. Breakthrough technology. The Blueair ECO10 combines patented HEPASilent™ filter technology with a superior EC fan motor to deliver markedly higher energy efficiency than conventional air purifiers. Other new features include two built-in speeds, four effective pre-filters and a main filter unit that can be vacuumed to prolong service life. Low power consumption. The Blueair ECO10 runs on just 10 watts of power, making it extremely energy efficient. It is nearly 10 times more energy efficient than the minimum performance requirements for energy-efficient room air purifiers established by the U. S. Environmental Protection Agency for its ENERGY STAR program. Familiar features. Like its siblings, the Blueair ECO10 offers exceptional performance, unmatched quality, whisper-silent operation and an unbeatable warranty. All stylishly packaged in an award-winning Swedish design.